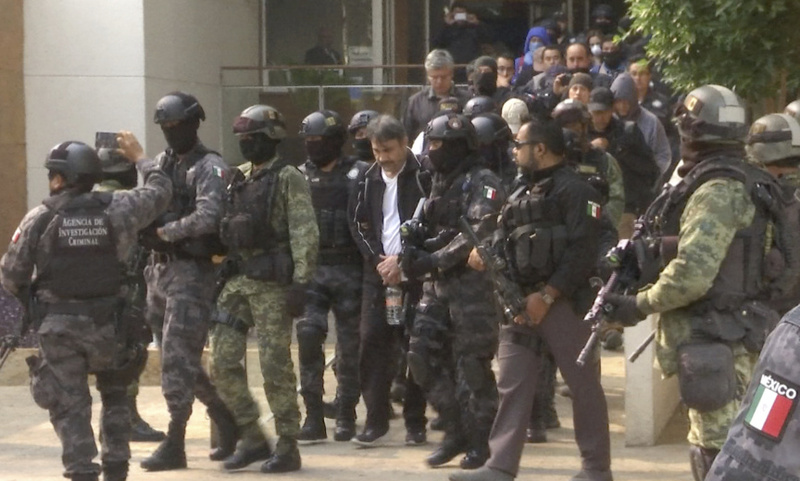 MEXICO CITY (AP) — Sinaloa cartel drug lord Damaso Lopez was extradited Friday from the border city of Ciudad Juarez to the United States, Mexico's federal attorney general's office said. Known by his alias "El Licenciado," which is a title for college graduates, Lopez was the right-hand man of drug kingpin Joaquin "El Chapo" Guzman and helped him escape from a Mexican prison in 2001. After Guzman's arrest in 2016, he started a bloody battle with Guzman's sons for control of the Sinaloa cartel. Acting Attorney General Alberto Elias Beltran said Lopez "is potentially a key witness" against Guzman, who is facing trial in the United States. Lopez, 52, has been charged in the U.S. with conspiring to distribute cocaine and commit money laundering and could face life imprisonment if convicted. His full name is Damaso Lopez Nunez. "Lopez Nunez's arrest and extradition demonstrates the commitment of the United States and our partners in Mexico to the pursuit of drug traffickers who seek to flood our streets with addictive and deadly poisons, for their own illicit gain," acting U.S. Assistant Attorney General John P. Cronan said. The Drug Enforcement Administration said Lopez will make an initial appearance Monday in federal court in Alexandria, Virginia. Mexican officials blame him for violence in the Pacific coast states of Sinaloa and Baja California, especially a string of killings in the twin resorts of Los Cabos. Lopez apparently sought to ally himself with the Jalisco cartel, Mexico's fastest-growing drug gang, to help in his battle with Guzman's sons. Lopez was arrested at an apartment building in Mexico City in 2017. At that point, his wing of the drug cartel appeared to collapse, and his son, Damaso Lopez Serrano, turned himself in at the U.S.-Mexico border, becoming the highest-ranking member of a Mexican cartel to surrender to U.S. authorities. The son pleaded guilty to drug smuggling charges, saying he orchestrated the shipments of thousands of pounds of methamphetamine, cocaine and heroin to the United States. With Guzman in jail, the Sinaloa Cartel has been variably controlled by Ismael "El Mayo" Zambada Garcia and Rafael Caro Quintero, two of the most traditional, old-school capos, in addition to Lopez and Guzman's sons, Ivan Archivaldo Guzman and Jesus Alfredo Guzman Salazar. Guzman was extradited to the United States in 2017 to face drug trafficking, money laundering and other charges. He has pleaded not guilty.